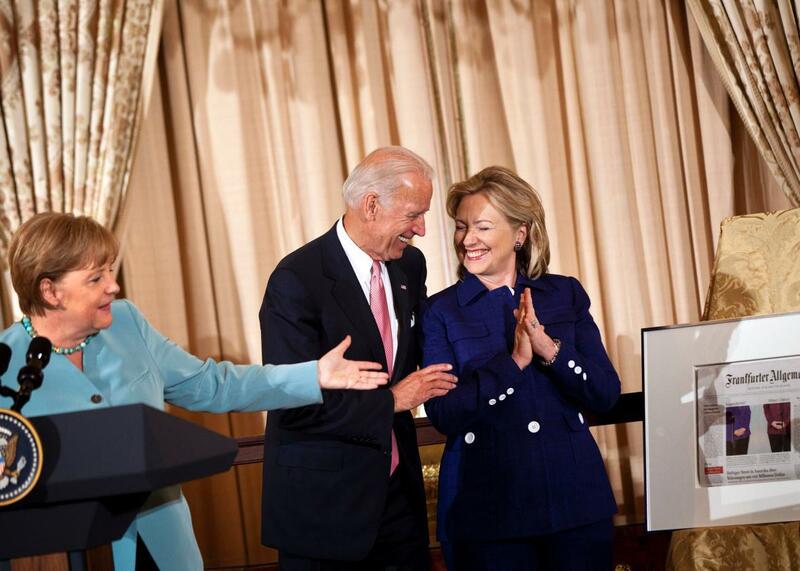 Joe Biden's departure will already boost Hillary's poll numbers. Vice President Joe Biden watches as German Chancellor Angela Merkel presents a front-page clipping from the Frankfurter Allgemeine to Secretary of State Hillary Clinton during a luncheon at the State Department on June 7, 2011, in Washington, D.C.
Joe Biden brought an end to the speculation that he would be a late entrant into the 2016 race on Wednesday. Flanked by his wife Jill and President Obama in the White House Rose Garden, the vice president made it clear that his decision to forgo another presidential run was less about his desire to be commander in chief and more about the challenges of quickly assembling the resources he’d need to compete on the campaign trail. My colleagues will have more on the veep’s decision a little later, but for now I’ll state the obvious: Biden’s departure is great news for Hillary Clinton’s campaign (even if the vice president took some not-so-veiled parting shots at her during his afternoon speech). As I explained this summer, if Biden would have gotten in the race, he’d have been able to challenge Hillary in ways that her current rivals cannot—not the least of which being “Mr. BFD” Biden’s ability to convincingly sell himself as Obama’s successor. For the past six-plus years, Biden’s been the president’s right-hand man—sometimes quite literally—on everything from Iran to gun control to Obamacare. Yes, Clinton would have remained the overwhelming favorite to win her party’s nomination next summer, but his entry would have given Democratic power brokers a plausible establishment alternative to Clinton. Even if Biden couldn’t overtake Hillary, his presence would have eroded some of her support and opened the door further for Bernie Sanders to snag an early victory in Iowa or (more likely) New Hampshire. With Biden’s exit, though, Clinton can now breathe a little easier. In the meantime, she can also expect see an immediate bump in the national polls (her second such jump this month). In the RealClearPolitics rolling average, Clinton currently has the support of 48 percent of Democratic voters, compared with Sanders’ 26 percent and Biden’s 17 percent. When pollsters have left Joe out of the picture, Clinton’s numbers have improved all the more. In the most recent Washington Post/ABC News survey, for example, Clinton bested Sanders by 31 points (54 percent to 23 percent) among registered Democrats when Biden was included in the list of choices. When pollsters assigned his supporters to their second-choice candidate, though, Clinton’s advantage on Sanders jumped to 39 points (64 percent to 25 percent). This week’s Wall Street Journal/NBC News poll tells a similar story: With Biden as an option, Clinton led Sanders by 20 points among Democrats (49 percent to 29 percent); without Biden, Clinton’s lead on Sanders grew to 25 points (58 percent to 33 percent). Those leads aren’t what they were back before the Biden buzz and Bernie-mentum began this summer, but they are still very strong. Clinton entered October facing three big question marks: How would she perform at the Democratic debate, would Biden jump in to challenge her, and how well would she survive this week’s grilling from the GOP-led House panel investigating Benghazi. The first two of those have now broken her way. We’ll find out how the third goes on Thursday.